where she learned a huge amount about recognising talented writers and developing strong stories. 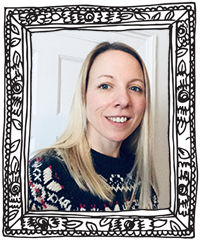 As a freelance fiction editor, she works on a range of fiction titles for a number of different children’s publishers, including Head of Zeus, Pushkin Press, Hot Key Books and Usborne. She lives in a lovely village in Warwickshire, balancing editing with looking after her three small children. Obviously, they are all bookworms in the making!